I’m a firm believer that any business is built and established on relationships. Someone once said to me “treat people how you’d expect to treated yourself and you’ll go far”. That sort of hit the nail on the head for me. I’m not all about selling boxes and moving whatever is flavour of the month. Instead I like to think I’m taking my customers on a musical journey of discovery and learning. Take a fairly conventional (and good!) 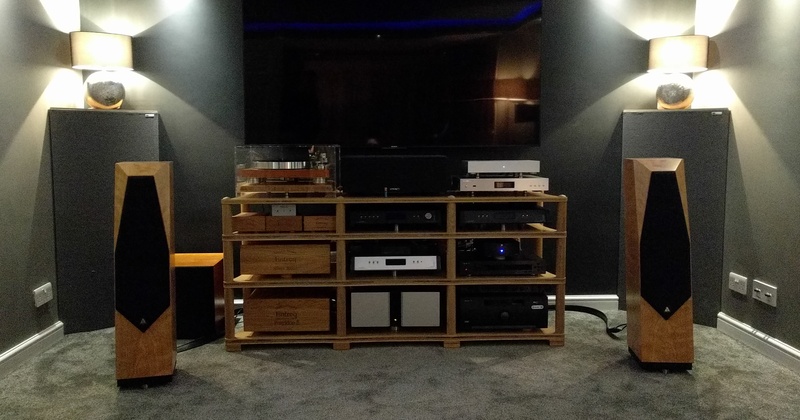 hi-fi system and utterly transform its performance whilst retaining the core components of the system to squeeze every possible drop of performance out of it and, of course, when those hardware component upgrades are carried out the solid foundations that have already been laid ensure that any new purchase will absolutely sing from day one. People seem to like the way I operate, they come back for more. I have a couple of clients I regularly see socially and I’m even the godfather of one of their children. Over the time I have known David he has looked after me, allowing me to try things in the comfort of my own home and to learn what would work best for me. His knowledge of systems, what will work with what and their interaction with a room is second to none. Recently,we have worked to completely revamp the system, adding Entreq and Stillpoints throughout as well as excellent product from Vitus and dCS. David’s patience and willingness to try things, then try again, and again has been very refreshing. I hope in many ways, we have learnt from each other what works and what doesn’t. Having someone I would call a friend in the business,has made this hobby of being an Audiophile truly fun and rewarding. I have no hesitation in recommending Audio Therapy for anyone who is tired of the run of the mill HiFi dealers – more interested in box shifting than music.